Battlestar Galactica icon Edward James Olmos has been cut from The Predator. "I’m not in the show though," Olmos said. "It was too long so my character, they had to take me out. They were like half an hour, 3/4 of an hour too long. So I understand why." Olmos was cast in the Shane Black sequel last year and was to portray a four-star General. 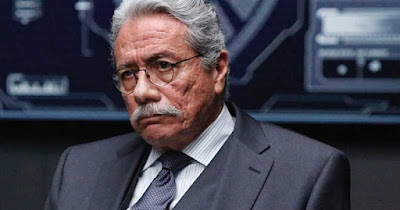 There appears to be no hard feelings between the actor and director, with Olmos explaining that he received a call letting him know that his scenes wouldn't make it into the final cut of the film. "It was gracious of them to call me and tell me, ‘Hey, we really feel bad,’ you know?" Are you disappointed that Olmos won't appear in the film next month? Starring Boyd Holbrook, Olivia Munn, Thomas Jane, Keegan Michael-Key, Trevante Rhodes, Sterling K. Brown, Jake Busey and Jacob Tremblay, The Predator opens September 14th.